The final Hartnell era Dalek story. The Daleks Masterplan is a 12 episode epic and really marked the absolute height of Dalekmania in the United Kingdom. Spanning 3 months, it was somewhat darker and bleaker than previous Dalek stories. The Doctor, Katarina and an injured Steven land on the planet Kembel. The Doctor ventures out to explore the planet in the hopes of finding help for Steven. Meanwhile the rescue mission that is sent to find Marc Cory is wiped out by Daleks and Vaarga plants except for the team leader Bret Vyon. Bret soon finds the Doctor and tries to force him to take him back to his ship, hoping to use it to escape back to earth, the Doctor however knocks Bret out and ties him up in the TARDIS. The Doctor then ventures out into the jungle again and soon discovers that the Daleks are on Kembel. Bret meanwhile is able to help Steven by giving Katarina a pill in his pocket which heals Steven’s flesh wound. Bret warns Steven and Katarina of the Daleks and not knowing how to pilot the TARDIS convinces them to leave it telling them that it isn’t safe in there (unaware that the TARDIS is indestructable). The three meet up with the Doctor who tells them that they should have stayed in the TARDIS . However sadly they are unable to return as the Daleks find the TARDIS first. Now knowing their mortal enemy is on Kembel the Daleks burn the jungle to the ground to smoke him out. The foursome are able to escape however and make their way to the Daleks city. They discover that Mavic Chen is working with the Daleks. Mavic Chen is the guardian of the earth solar system, the heart of the earth empire. Despite wielding considerable power, Chen still yearns for more and is betraying his own kind to the Daleks. The Doctor is able to knock out one of the delegates Zephon and goes in disguise as him whilst Vyon, Steven and Katarina head to Chen’s ship and take it over. The Doctor attends the Daleks meeting with their allies including Chen and discovers what it is the Daleks are planning on Kembel. The Daleks are hoping to create a new super weapon called the Time Destructor. The Time Destructor is capable of ageing entire worlds to nothing but dust and will allow the Daleks to destroy the earth empire and billions of other worlds across the entire universe. The Daleks however are only able to build the weapon with the help of all of their various allies, with Chen supplying them with the most vital component, the tarranium core. The core can only be found in earth’s solar system and it has taken decades to get the small amount Chen has. Without the core the Time Destructor is useless, thus Chen is the real linchpin in the entire plan. Zephon meanwhile soon awakens and sounds the alarm. As the delegates and the Daleks panic the Doctor is able to swipe the Tarranium core and make his way back to Chens ship, moments before Bret Vyon was about to leave. The Daleks exterminate Zephon for allowing this to happen as well as his arrogance. Unable to shoot Chen’s ship down without damaging the Tarranium, the Daleks instead attack its engine’s causing it to crash on a nearby planet called Desperus where the worst convicts and criminals of the earth empire are left to rot. They then send a squad of Daleks to find and retrieve it, but the Doctor is able to repair the ship before they arrive, causing the black Dalek to exterminate them for their failure. After the Doctor, Bret, Steven and Katarina escape back into space Katarina is soon jumped by Kirksen a criminal from Desperus who stowed away on board the ship. Kirksen threatens to kill Katarina unless they take him back to Kembel. Kirksen does not wish to go back to Desperus or Earth as he is wanted back there, but wishes to go back to Kembel instead, being unaware of the danger of the Daleks. Katarina in order to prevent them from having to go back to Kembel opens the airlock her and Kirksen are both trapped in, causing them both to be sucked out into space. The Doctor, Bret and Steven manage to make their way back to earth, but once they get there they discover Chen has got there first and has framed them as traitors. Bret is killed by another Special Space Security agent Sara Kingdom. The Doctor and Steven are pursued by Kingdom into an experimental teleportation room where all three are accidentally teleported to a far away alien planet populated by invisible alien creatures. There the Doctor and Steven are able to convince Sara that they are not traitors and Sara is overwhelmed with guilt at having murdered Bret not only because he is innocent, but because he was her brother! The Daleks soon track them down and take them prisoner. However before they can take them back to Kembel the Daleks are attacked by the invisible inhabitants of the planet. The Doctor, Steven and Sara manage to escape in the Daleks own spaceship. They head back to Kembel and make their way to the TARDIS, though along the way they create a fake Tarranium Core which they hand over to the Daleks, barely managing to escape extermination. The Doctor, Steven and Sara go on to travel for a long while together having many adventures including one at Christmas in the 1960’s where the Doctor is arrested for trying to get into the TARDIS. The three soon end up in the set of an old silent film, before going off on other adventures The Daleks however quickly realize that the core is a fake when they use one of their delegates Trantis as a test subject. The Daleks dispatch another time machine to follow the Doctor throughout time and space. The Doctor meanwhile is also being pursued by another old enemy the Meddling Monk a renegade time lord whom he had faced in the past. After foiling the Monks attempts at revenge all 3 time machine’s end up in ancient Egypt. 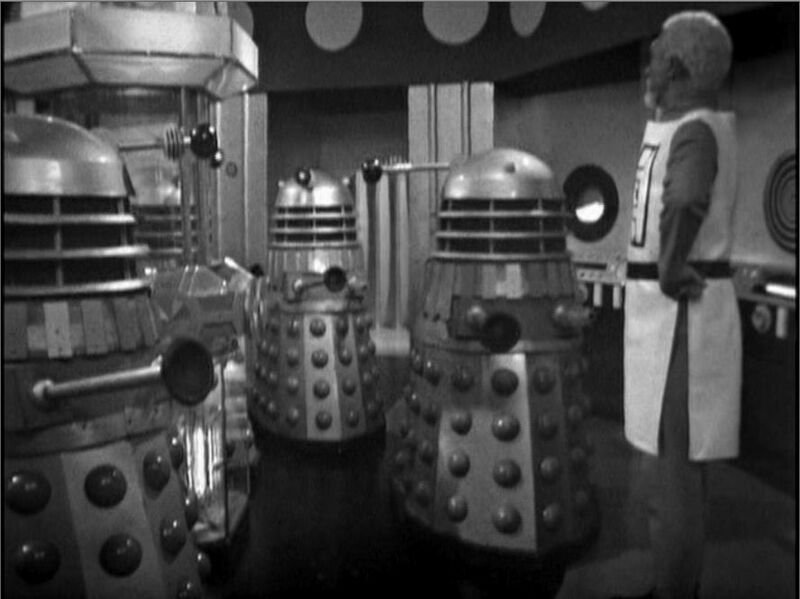 Here the Daleks who are aided by Mavic Chen manage to capture The Meddling Monk, Steven and Sara. They threaten to kill them unless the Doctor hands over the real core. Out of options the Doctor is forced to hand the core over to the Daleks. The Doctor however is able to steal the directional UNIT from the Monks TARDIS which allows the Doctor, Steven and Sara to pursue the Daleks back to Kembel. Here the Daleks imprison their allies including Chen, but Steven and Sara however free them and tell them all to unite against the Daleks. Chen however still believes he can reason with the Daleks and captures Steven and Sara and takes them to the Dalek base beneath Kemble where their army and the time destructor are ready to begin their war across the rest of the universe. The Daleks refuse Chen’s offer of an alliance and exterminate him. Whilst they are busy killing Chen the Doctor who has snuck into their base steals the Time Destructor. Realizing that the Daleks let Chen run out of the room before exterminating him means that the Daleks can’t risk firing on the time destructor, the Doctor uses it as a shield to allow himself and Steven and Sara escape. The Doctor then tells them to get back to the TARDIS. Whilst Steven agree’s, Sara sadly stays behind thinking she can help the Doctor and when the Doctor uses the time destructor on the surface of the planet Sara is aged to death along with the Daleks. The Doctor only survives long enough to get back into the TARDIS due to his time lord life span. The time destructor goes on to destroy the entire surface of Kembel and all of the Daleks and Vaarga’s, before burning itself out. With the Time Destructor destroyed and the vast army of Daleks dead, the universe is saved, but at a terrible cost, the deaths of Katarina, Bret and Sara. Dalek Supreme/ No power in the universe can stop the Daleks! Bret Vyon/ Sir! Will you shut up? At least that’s stopped you arguing. The Doctor/ Well, upon my soul. Bret Vyon/ Now look here, I don’t care what happens to you, but I’ve got to warn Earth! The Doctor/ Yes, and you will have to do far more than that! If the Daleks are doing something drastic, then we have to stop the Daleks! Now will you shut up!!! sir? Hmm? At 12 episodes long, The Daleks Masterplan is the single longest story in the shows 50 plus year history (unless you count Trial of a Time Lord as one rather than three stories). Naturally as a result of this its probably a bit too much to watch in one sitting. Still make no mistake this is a classic adventure. Its got so much going on in it that despite its incredible length, there was never a moment I felt bored (apart from the novelty Christmas episode which really is as bad as its reputation. Comedy I don’t think was ever Terry Nation’s strong point.) Still for the most part both Terry Nation and Dennis Spooner fill the story with so much excitement and action that it actually managed to hold my attention throughout its 5 and a half hour run. It takes us through so many different and exotic locations across all of time and space, from the jungle’s of Kembel, to the desolate prison planet Desperarus, to the Pyramids of Egypt and its also laced with plenty of shocking and tragic moments. This story marked the first time that a companion actually died in the series. Both Katarina and Sara who also technically counts as a companion die horrible, violent and arguably in Katarina and certainly in Sara’s case pointless deaths. Whilst this would not seem like a big deal nowadays where main characters always die horribly, in 1960’s television it would have been unheard of. Especially in a family show. Terry Nation would of course repeat the idea of main characters being killed off suddenly and pointlessly in his later series “Blake’s 7”. Terry Nation was always pushing the boundaries and “The Daleks Master Plan” is definitely one of his darkest stories. The Daleks themselves are brilliant here. After their mishandling in their last full length story “The Chase” Nation really makes them seem like a force to be reckoned with by not only having arguably two companions die, but also other supporting characters too such as Bret Vyon. Also for the first time we get to see what one of their super weapons can actually do when the Time Destructor is set off on Kembel. The fact that it is the Doctor that sets off this weapon that we are told can destroy time itself is also a nice touch. Nation also adds a more manipulative and sneaky snide to the Daleks characters, showing how they are able to fool corrupt human beings such as Chen as well as other life forms into helping them. Though Nation would not take us quite into the manipulative side of the Daleks as much as Whitaker later would, he does still succeed at showing the Daleks as more restrained villains than the hysterical kill machines of previous stories. Nation had shown us glimpses of the Daleks more manipulative side in “Mission to the Unknown”, but here he really takes it to a whole new level through the character of Mavic Chen. Mavic Chen marks the beginning of a trend in classic era stories of devious human or humanoid characters who believe they can reason with or trust or even manipulate the Daleks for their own reasons. Other characters like this include Bragen in “The Power of the Daleks”, Maxtible in “The Evil of the Daleks”, The Controller in “Day of the Daleks”, Galloway in “Death to the Daleks”, Lytton in “Resurrection of the Daleks” and Mr Radcliff in “Rememberance of the Daleks”. Even Davros to some extent fills this role in most of his appearances, especially in “Genesis of the Daleks” his debut. Sadly the new series hasn’t continued with this trend. The only new who story that has is “Daleks in Manhatten/Evolution of the Daleks” which featured the scheming Mr Diagoras as the Chen type of character. Mavic Chen is definitely one of the shows most memorable villains. Its brilliant watching his own lust for power gradually push him over the edge. By the end of the serial he actually thinks he is above the Daleks and its hilarious when he finally snaps after realizing he will never control them, and actually deludes himself into thinking he is their master. I love watching him give orders to the Daleks who are almost bemused at first, before they finally have enough and just exterminate him. Kevin Stoney is absolutely excellent as Chen. He really brings the character to life and its not hard to see why they brought the actor back to play the similarly treacherous Tobais Vaughan many years later. All of the performances in this story are excellent. Jean Marsh is great as Sara Kingdom, though sadly she isn’t given much to do after her initial few episodes. Nicholas Courtney makes a very strong debut as Bret Vyon. Again much like with Kevin Stoney its not hard to see why they asked him back as he is every inch the perfect hero here. Dashing, handsome, likable and charismatic. He had to land a leading role sooner or later in his career. Peter Butterworth also gives a good performance as the Monk too. He brings much needed humor to the story. Unlike the humor of “The Chase” or “The Feast of Steven” the Monks humor does not turn the show into a parody, but still helps to eleviate the darker tones overall of the story from becoming too overbearing. William Hartnell and Peter Purves are on top form as usual too. We can see just how far the Doctor’s come from the first Dalek story where he was a self serving coward, happy to leave the Thals and even Barbara in the clutches of the monsters just to save his own neck. Here he is unquestionably the hero just like he is in later incarnations. His companions are two steps behind him throughout it and he is the one who single handedly destroys the Daleks at the end. Even in “The Dalek Invasion of Earth” the Doctor was still not quite the central heroic figure he is here. The scene where the Doctor tells Bret to leave him if he is not back soon and Bret tells him he is very brave, to which the Doctor responds that he is only doing what needs to be done is worlds away from the character in the first Dalek story who was happy to let the Thals wander into a trap, or even the character in “The Keys of Marinus” another early Nation story where the Doctor had to be forced into helping someone. Here he not only risks his life and thinks nothing of it, but he also actively seeks out the danger at the end of the story when he steals the directional unit from the Monks TARDIS. This just goes to show how well developed and interesting a character the first Doctor was. One of the greatest things about this story that modern audiences sadly are unable to enjoy is Douglas Camfield’s excellent direction. As of the writing of this article only 3 episodes of this 12 part epic exist. Douglas Camfield has always been my favourite Doctor Who director and even in these three episodes we get glimpses of his extraordinary talent, such as in the scene where we see the sunlight focus in on a Dalek dome. Its just such a shame that modern audiences will most likely never get to see how he tackled the big scenes like Kembels destruction and Sara’s death. Overall whilst it might be a bit too long, The Daleks Master plan is still an all time classic for me and the perfect final Dalek story for Hartnell’s Doctor. This was originally intended to be the final appearance of the Daleks in Doctor Who. Terry Nation later stated that he regretted making the story so long, as he felt that 3 months of anything would be too much for people. Despite this however viewing figures remained strong throughout its run. This is the first Dalek story not written entirely by Terry Nation. He wrote episodes 1-5 and episode 7, whilst Dennis Spooner wrote episode 6 and episodes 8-12. Episode 7 is the first ever Christmas episode of Doctor Who. It was also the only Christmas episode of the original series run. It is also finally the only Doctor Who episode to be lost forever as it was never sold abroad having been made as a throwaway episode. 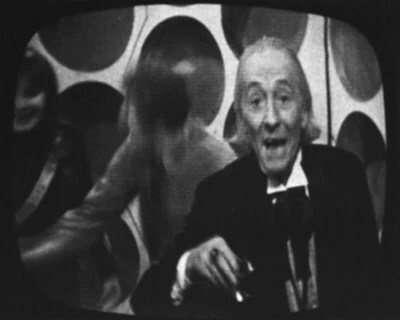 The famous scene where William Hartnell says to the audience “and a merry Christmas to all of you at home” was not ad libbed, but was the custom of BBC series at that time for the cast to wish the audience Merry Christmas. This marks the only time a character breaks the fourth wall in Doctor Who’s long history. This is Ian Levine’s favourite Doctor Who story. Levine is a noted Doctor Who fan who discovered many 60’s episodes and saved others from destruction including the first Dalek story.